Browse over 200 Excel spreadsheet templates, financial calculators, calendars and Word documents from within a task pane in Excel or Word. At Spreadsheet123, we are constantly working on making templates and documents we create more accessible and available for wider audience. This app is intended for making things even simpler and faster. You can browse entire collection of our free spreadsheet templates and documents without leaving the comfort of Excel or Word. 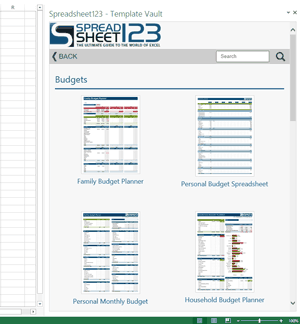 As the list of templates and documents on spreadsheet123.com is constantly growing, the Template Vault app will include more and more documents and spreadsheet for you to browse and download. You will find a link to the relevant web page under each template, where you can find more information and learn more about specific document, download versions for Google Docs or Open Office, leave your feedback and more. In addition, you can also use the link below to browse and download templates on your phone or any other mobile device, provided that you have internet connection available. Spreadsheet123® is registered trademark of Spreadsheet123 Ltd.
Spreadsheet123.com is not associated with Microsoft.